How do you get hundreds of people to turn up to public venues on weekends to watch your magic show? How do you do this without having spent any money on advertising yourself in the past 11 years? This interview with The Great Zucchini looks at no cost marketing for magicians. The Great Zucchini aka Eric Knaus has done this. Along the way he has become an unlikely magic superstar in his market and creator of The Great Zucchini Live and Kidshow Rockstar DVD’s. Families want to be at his shows. Even the family that lives at 1600 Pennsylvania Ave NW, Washington, D.C. That’s right, Michelle and Sasha Obama are his fans. Join the Great Zucchini now as he slices up his marketing strategy into bite size pieces for us. Why should you give random compliments during the show? Check out The Great Zucchini in action. 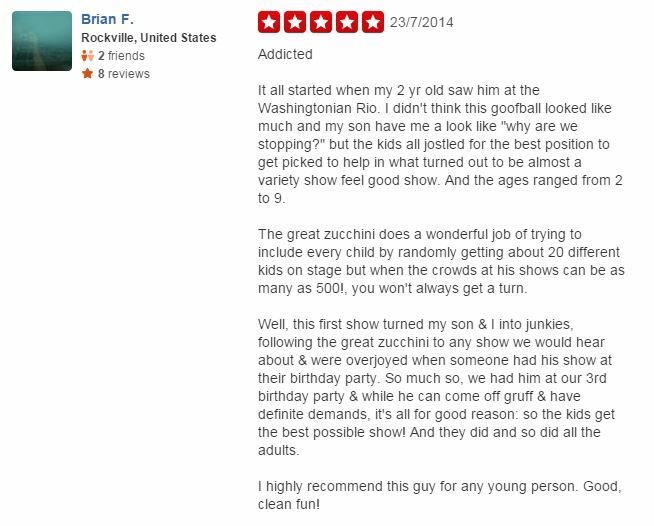 Read this YELP review (I grabbed the first one I saw at the top of the page). What you hear is that these people have a relationship withe the Great Zucchini. Click on the picture and read the other reviews and you see this a pattern. Note too you rarely see the word ‘magician’ or ‘tricks’, instead you read ‘zucchini experience’ and ‘the kids and family will be transported’. What is Eric doing that you and I are not? What can we change to get closer to this ideal?